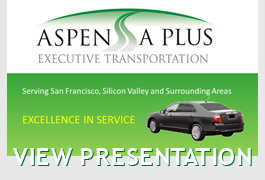 Aspen A Plus Executive Transportation is your complete destination management solution for executive travel throughout San Francisco Bay and its surround areas. Our luxury fleet offers clean, late model vehciles and we cater to today's green business models and travelers looking for service excellence at competitive pricing. Our San Francisco Bay executive car service is all about the personal transportation experience. Our team of transportation industry professionals and chauffeurs strive to make each cleint comfortable and meet their travel needs. With just one call, Aspen A Plus Executive Transportation can supply all your ground transportation throughout the San Fransico Bay and it its surround areas. Our luxury vehicles and professional chauffeurs make Aspen A Plus your executive transportation partner of choice. Our fleet is made up of corporate level, luxury vehicles. Enjoy all the comforts of a luxury professional vehicle. Most of our vehicles have a Powerpoint for you to use your electronic devices and are stocked with cold water. Aspen A Plus Executive Transportation provides professional ground transportation services to the San Francisco International Airport. We strive to meet the needs of business travelers and know that no detail is unimportant. To better serve our clients, we implement a Flight Tracking System to monitor our client's flights. We can track your arriving or departing flights to ensure on time service regardless of your flight's status. Our San Francisco airport transportation service operates 24 hours a day, 7 days a week, 365 days a year. Experience our professional San Francisco executive coach transportation services. Our fleet offers corporate and group travelers a comfortable way to get to your destination of choice. From our SFO Airport Private Shuttle Services to San Fransisco Convention Transportation, Aspen A Plus Executive Transportation offers the best possible choice for your group transportation needs. Call us to today to open a corporate Transportation Account or use our Online Reservation System to book your next travel arrangement. We look forward to serving you. Call for free quotes or with any questions.